After my post the other week about strawberry jam, Jen commented that she had made strawberry and balsamic jam to have with cheese. I thought this was a brilliant idea as we do love a bit of quince or plum paste with a nice cheddar. So I had a bit of a think about the recipe I'd used and how I'd need to tweak it to give a thicker jam and how much of a sugar/balsamic ratio I'd need. In the end I think I got quite close on my first try. Cut the strawberries into small pieces and leave to macerate in the balsamic vinegar and sugar for a couple of hours. I give it a little mix about half way through to try and get the sugar dissolving in the liquid. 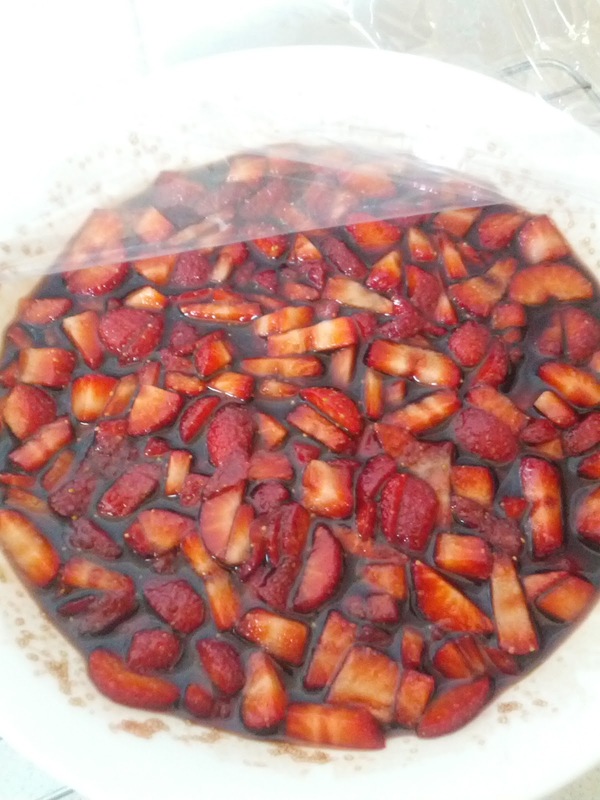 Strain the liquid off, reserving the strawberries, and heat on the stove until the liquid has reduced to approximately half its original volume and it is starting to thicken. 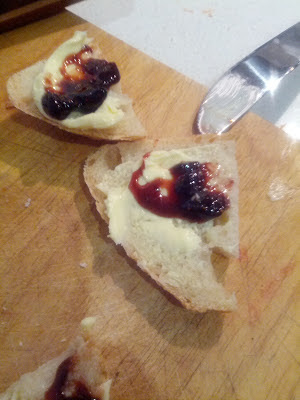 If you want a thicker jam you will need to go further with this stage. Add in the strawberry pieces and cook for a bit longer until you are getting quite a jammy consistency, add the squeeze of lemon and adjust your flavours as you want. Transfer to sterile jars and put in the fridge. It will harden up in the jars in the fridge so don't worry if it is still a bit runny for your liking. You could use balsamic reduction for a much richer balsamic flavour or a little less sugar. It is really just a matter of your taste. 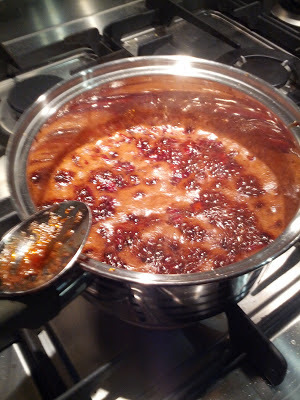 And if you want a paste instead of a jam then you will need to reduce your jam more or add some more pectin. This is a nice jam to have with cheese and even on bread on its own as it is just that little bit less sweet than regular strawberry jam. Sounds yummy! Glad you tried it. This year was my jam-making extravaganza, and I made 6 different kinds , of which 3 are blackberry-based, though that's mostly due to the fact that blackberries grow wild on the trail behind our house and no one bothers to pick them. My husband isn't one to let something free go wanting, so he picks the berries and I make the jam. This year in addition to a standard blackberry jam, I made a small batch of blackberry-chipotle, and a larger batch of blackberry-peach-basil. The latter is so yummy that I could eat it all day.